Click the icon table to view the Meeting detail page. tressele that's alright. it just a matter of time. CharlieSim going to break 0.30 TODAY!!! tressele lets hope for the best! azrylamyr why this counter always like that..fundamental good, profit good..but price movement no good..
GinTech cuz tauke wana shake you down into crocodile pond..
shortinvestor77 Like Ranhill before all the way down from 0.86 to 0.66 even result were good and good dividend. But now 0.92.
shortinvestor77 Buy more at 0.275. Pete118 Collect now or too late. year’s corresponding quarter ended 30 September 2017 of RM2.83 million. increase in staff costs following the hire of additional staff and increase in finance costs. (iii) approximately RM214 million worth of tenders still pending. Beza Good revenue, just hoping hiring additional staff for new projects to come. Beza worth to hold for 25 cents and below as dividend is 1 cents. Beza Overreacted this morning. KAB is till making money. Not losing money. A rare net cash and dividend company. shortinvestor77 Agree. That's why most retailers lose money in the market! shortinvestor77 Already have new projects, then KAB hired new staff lah! Its business is growing. 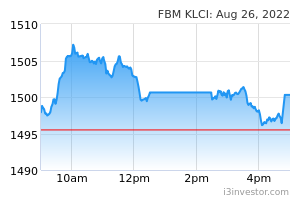 MD told at the AGM/EGM recently, KAB will do well even in the recession time. Beza Will go back to 0.245 / 0.25 soon. zhen wei & JP wah so confident a? got sturdy cfo & staff maybe can thrive thru. BJ ZL Whether this counter drop over already? Just becuase result not good? tkk1127 Is new Buyer purposely push down the price in order to buy cheaper shares through private placement. However the price is too low already and below it's IPO price. I don't think management will let the price keep go down. Look at mrcb azrb gamuda myeg dayang frntken...all flying.. This useless stock trading below ipo of 25sens. Profit figures so good...performance wise useless...similar to my trimode...ipo 63sens..
Now only 45sens......just have to wait patiently..
hisehatu seems like will sleep another few month.good nite guys. tressele sleeping. it will wake up when construction theme takes place.